Our favorite crow murder engaged with the health care system this week. 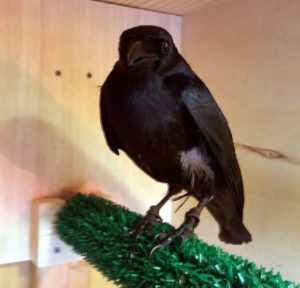 As usual, there were antics, ew moments, moral victories over the vet staff, and general admiration of Gwen and Stephen’s corvid magnificence. Spring is still but the remotest of hopes, but our pair has begun to burble at each other, signaling that the time for their annual check-up has arrived. So after a stressful game of “net the crow,” G&S were packed into a varikennel, and off we went to see Dr. Costanzo. Gwen was dazzling. She is in perfect health, and managed to escape out of the crate during the exam, fooling the vet staff for the third year in a row. No sign of capillaria. (For those of you not up on your avian parasites, capillaria is transferred when a bird eats an infected earthworm.) All systems should be a go for a successful breeding season. Stephen Crowbert’s tongue which may or may not be scarred. Stephen Crowbert is also in fine form, although his condition regarding capillaria is more ambiguous. His tongue is swollen but there is no sign of yellow plaque, so it’s unclear whether there is scarring from past rounds or whether he’s got an active case. 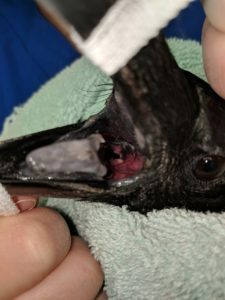 If you like your crow photos with a moderate ick factor, here’s a shot of Stephen’s mouth. It should be completely black. Because the fun never stops, the next step will be to give him two injections of ivermectin. Super friend Gabby gets to lead Operation Stick Stephen. That should be an interesting adventure. It should also be noted that Gwen and Stephen were the center of attention not only from other pet-owners but from the staff who stopped by to meet them. Apparently our dynamic duo are even exotic for those at an exotic vet practice. As usual, they recovered fairly quickly from the ordeal, especially after I left a slice of Bavarian Swiss cheese ($12/pound) as a peace offering. Which brings us to our sweet Zen, who cannot catch a break. I noted recently that she was “in a snit.” It turns out she has not been feeling well. Birds are very careful not to show any signs of illness, so it’s tough to figure out when something is off kilter. Zen started losing (i.e. plucking) feathers off of her left thigh. Feather plucking is one of the few indications that something is wrong. What that something might be is an entirely different question. The ever-alarming internet suggested anything from boredom to cancer. So I bundled Zen into a box and brought her along to see Dr. Constanzo as well. She has put on a little weight, which is good, but she displayed signs of pain when her leg was manipulated. That explains the feather plucking, as she instinctively is pecking at the spot to get the pain to stop. The cause of her discomfort, however, remains unclear. They took blood and the results are normal. The Doc thought it might be reproductive, as in a swollen ovary impinging on the sciatic nerve, until I confessed that I didn’t know Zen was female but was just guessing from her small size. So that meant a DNA test. We’re still waiting for those results. If it’s nerve related, the doctor asked me whether I would be open to avian acupuncture. Yes, it turns out that “would you be willing to take your bird to an acupuncturist?” is a meaningful sentence in the English language. In the meantime, Zen is on meds that appear to be helping with the pain. At least she seems more cheerful. She is back to wadding up the towels on the floor of her enclosure and other activities to ensure that cleaning up after her is as awkward and tedious as possible.